Facebook Deals is a new offering – and quite frankly – a big category killer that all businesses should pay attention to. It’s going to be a big deal in the ever-growing world of location-based social marketing. Millions of people are “checking-in” on Facebook to tell their friends where they are and what they’re doing and Facebook Deals is a great way to give them an incentive to do so as often as possible. Facebook Deals is basically a way to provide customers with a “Deal” or incentive in exchange for checking in on Facebook. When they’re at your location, your company will show up on their list of places to check-in. If you have an incentive, there will be a little icon next to your location that they can use after they check-in. Simple, right? Why would you give them a deal? Facebook deals is a great way to let your customers work for you. Every time that they “check-in” at your location, their “status” shows up as an update on their wall and all of their friends and followers can see. Every time someone checks-in at a location there are potentially hundreds of people that will see the name of your business. Many times they’ll make additional comments about what they’re doing there, who’s with them, what’s good or bad, and encourage others to do the same. If they tag people that are currently with them, the status shows up on their wall and to all their followers. It’s a great way to let your customers spread the word about your business. But if they’re already checking in, why would I give them a deal? When someone “checks-in” on Facebook, they receive a list of potential places in the surrounding area that they can check into. If they’re at your location it will show up on the list but so will additional businesses around the immediate area. 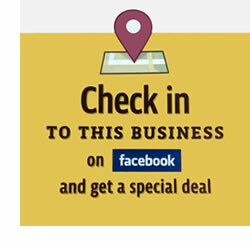 If your business doesn’t offer a deal they might just check-in where they’re going and move on. But if you offer a deal it will bring your business to their attention – and this is attention that you might not have received without it. They might not be aware that your business even exists before they were alerted to your presence on Facebook. The deal might be just the incentive they need to visit, check-in and become a regular customer. Again, by default, when they check-in they tell all their friends about your business which can be very powerful. As a business owner, how do you get started with Facebook Deals? Step One: Claim your Facebook Places Listing. This can be a little tricky but that’s why we’re here to help. All you have to do is go to Facebook and perform a search in the top search bar for your business. If you don’t see your business listed then you need to create a Facebook Places listing. Note, if you have a Facebook “Page” for your business, this is not what you want. This will also show up in the search listings. Make sure that you are looking for your Facebook Places listing, not your company Facebook Page. It will be listed separately in the search results under Places. When you’ve located your Facebook Places listing, scroll down to the bottom of the left column and you’ll see a link that says “Is this your business?”. Click this link and follow the instructions to officially claim your business. Yes, Facebook is confusing but stick with us. Once you’ve successfully verified your Facebook Places Listing (which might take some time to show up), you’ll need to merge it with your Facebook Page. Don’t have a Facebook Page yet? Here’s how to get it done. To merge your page with your places listing simply go to your Places listing on Facebook, scroll down until you see “Merge with existing Page”. You should see your Facebook Page show up as an option. Select it and follow the instructions. Simply choose the type of deal that you want to offer, provide the details and schedule it. Your deal should start showing up new to your listing on mobile devices within 48 hours after it’s approved! Here’s to your success on Facebook! If you have questions or comments about Facebook or anything relating to Internet Marketing please feel free to contact us anytime and we’ll be glad to help. ← VIDEO: Does it Make Sense To Link Back To Other Web Sites?